I hear all the time how induction in VBAC is contraindicated. This is false. This is the kind of misinformation that materializes when we demonize all induction rather than specifying between elective and medically indicated inductions. It’s important to use clear, specific language when we talk about birth because there is a lot of confusion among moms, advocates, doulas, and health care providers about VBAC and induction. When I point out the lack of clarity many people have on the topic to “anti-induction advocates,” some respond that their focus is warning moms about elective inductions, which is absolutely needed. They genuinely believe that people are aware of the distinction between elective and medically-indicated inductions. However, that has not been my experience. In fact it’s been quite the opposite. There are many people who don’t understand the why, when, and how of inducing VBACs and that is impacting the abilities of women to make informed decisions and exercise their right of patient autonomy. The decision [to use Pitocin in a woman with a prior cesarean] can be made only by carefully weighing the potential benefits which oxytocin can provide in a given case against rare but definite potential for the drug to produce hypertonicity or tetanic spasm. This is in line with ACOG’s latest VBAC recommendations (3) where they say, “Respect for patient autonomy supports the concept that patients should be allowed to accept increased levels of risk.” This is information a woman can use to make an informed decision if she is faced with a medical condition that requires her baby be born sooner rather than later, but not in the next 15 minutes. To induce, have a cesarean, or wait for spontaneous labor when facing a true medical issue is a decision for the mom to make in conjunction with her supportive heath care provider based on the evidence of her risks, benefits, and options. If you just read bits and pieces of the Pitocin insert, or a few key quotes from an anti-induction article, you are going to miss the full story; much like how reading the full text of a study gives you context and details that you lack by just reading the abstract. Note the tone of these comments. There is no room for negotiation. Do you get the sense that they are just referring to elective inductions or all inductions? But the key question is: More risk than what? That is always what women should ask. More risk than remaining pregnant with preeclampsia? Ok, let’s say that is true. Then when a woman with a prior cesarean is diagnosed with preeclampsia, or another medical condition itemized by ACOG (4), and they agree that remaining pregnant has higher risks than delivering the baby, they should have a cesarean, right? Even if vaginal birth remains an option, albeit via an induced labor? Those moms shouldn’t have a choice, they shouldn’t have a say, they should just go straight to cesarean? How is that preserving choice for women and honoring their right to make their own medical decisions? That is what anti-induction advocates don’t understand: induction has its place. As does every other medical intervention. If you want to go straight to cesarean, rather than having a medically-indicated induction, that is your choice to make with your body. But don’t misrepresent the truth to other women. Don’t misrepresent what ACOG (1) or the Pitocin insert (2) says. Don’t misrepresent the risks of Pitocin by listing a mish-mash of complications with no rates or citations. Don’t say things that can be disproved with a single mouse click like inducing VBACs is against evidence based medicine. Don’t undermine a woman’s legal right to autonomy (5) by perpetuating the myth, that all induction, including when medically indicated, is wrong. Don’t dictate specific actions while withholding facts that would enable women to make their own decisions, even if they are different than what you would prefer. Does inducing a VBAC increase the chance of rupture??? YES. Does a women, and should a women have the right to choose that irregardless of that FACT??? YES. Is the most important thing informed consent?? I believe it is. To provide information supports choice and informed consent. To dictate a specific action while misrepresenting the evidence eliminates choice and prohibits informed consent . I advocate for the former. If you read my article (4), you will see that I list the reasons for medically indicated induction as well as provide an extensive review of studies illustrating the increased risk of uterine rupture. I do this rather than simply saying, “the risk of rupture is higher and thus you shouldn’t do it” because providing facts with context puts the choice in the hands of the mom, rather than me (or anyone else) dictating to her what she should do. 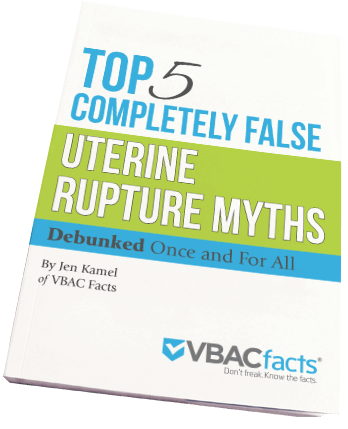 Some women will accept that higher rate of uterine rupture that comes with induction in order to have a vaginal birth and avoid a cesarean. Others will choose to avoid the increased risk of uterine rupture in an induced labor and accept the risks of a repeat cesarean section. Those are choices for women to make for themselves based on facts, not on misrepresentations of what other women (incorrectly) think is contraindicated. My mission is to increase access to VBAC. I advocate for informed consent and patient autonomy and that is why I share evidence rather than dictating what others should do. I only hope that this reasoning and evidence based position spreads because there are far too many people out there who persist in the inaccurate philosophy that inductions in a VBAC are always wrong even in the face of a valid medical reason. This does not support choice, women, or birth. This post is older. But i have a question my doctor said she wouldnt let me go past my due date since im trying for a vbac. My first was a csection because he was breeched so i never went into labor. She also mention that if i go past my due date i would have to have a c section. Is it possible that i cancel my csection and just let nature take its course? Yes. It is possible. ACOG doesn’t recommend cesareans at 40 weeks across the board. Hi, I just had my first appointment with the high risk doctors and after exploring your website extensively, I was able to ask all the right questions and feel really comfortable with all their answers but 2. One of them was about a routine cannula (which I can refuse) but my main question is about his suggestion to have regular stretch and sweeps from 39 weeks “to widen my cervix” as it is thought that my fail to progress with my last was cause she got stuck (48hrs before emergency c-section) but I think it was stress. Anyway my midwife agrees that I should do it, but I just don’t understand why at 39 week’s. Won’t it potentially put me in early labor if my bub is not ready to come? And if they accidentally break my waters, would that not lead to further intervention? wow… that was fabulous. it is also what happened with #4. I was so against induction but I was 37 weeks, bleeding bright red blood and after 8 hours, had no hard CTX that would bring about the baby’s birth, so we induced because I would rather induce than go c/s. we also induced out #6 because he had spent 3 weeks transverse breech and on the day of the app’t to make the c/s app’t, he turned. I was checking out and I said “hey.. could we get this baby out on induction before he turns around again”… I did NOT want a c/s so that elective induction was better than a c/s too. now we are facing VBAC with #10 and after #9 being born via emergency c/s, and my husband worries that I will stall again since I have been electively induced several times, he is worried I will end up c/s. I am happy to hear that it’s not a blanket absolutely written in stone no induction. I will be taking my homeopathy tablets with me but JIC am now better informed since everyone has been saying No induction.. and now I know what they should be saying is no voluntary, elective induction. Although well argumented in favor of women’s automomy and freedom of choice,,,, I am still wondering why there are no other acredited sources than ACOG and the Pit insert ????? What about ACNM, MANA positions and … Cochrane conclusions?? I’m unclear on what you would need further accredited sources on. Do you want to know where ACNM, MANA, and Cochrane stand on inducing VBACs when medically indicated? This article was more about people misrepresenting/misunderstanding what ACOG and the Pitocin insert say which is why I focused on that. It’s not meant to be a comprehensive article on inducing VBACs as I already wrote extensively on the topic here. I would also be shocked if ACNM, MANA or Cochrane came out against medically-indicated induction for the very reason I list in the article – this would leave women with no option other than cesarean. Evidence-based medically indicated inductions of labor offer an opportunity to improve maternal and infant health outcomes when selected complications of pregnancy are present (Mozurkewich et al., 2009). Evidence-based medically indicated inductions of labor are generally considered within a risk-benefit decision making process, in which the risks of the medical condition worsening or causing harm are balanced against the risks of an induction of labor, including consideration of the gestational age of the fetus. I’m also unclear on what you are still not convinced over. The safety of inducing a VBAC? The medical reasons why it would be done? If it should remain a woman’s choice: induction vs. cesarean? I would think that many, if not all, of the reasons for a medically indicated induction would risk a woman out of out-of-hospital care. Inductions do belong in the hospital where proper monitoring can be used. As Executive Director of toLabor, the international certifying organization for birth doulas I applaud your writing. We teach the importance of our choice of words, leaving our agenda out, providing evidence-based research as the best way to guide a woman to make a truly informed decision. We do not opinionate! We stress that you must read ALL not just what supports your beliefs in order to be a truly effective advocate and activist for change. To be dogmatic, black-and-white in your attitude is dangerous. Too many in the world of birth work are just that and this is the problem on “both sides”, they are allowing their personal interpretation be the voice in their professional life. When it is about you and your baby, be informed, be opinionated but when it is about others, healthy and true informed consent is well-rounded and left to the individual to decide. Thank you.